The weather was always going to be an issue at this Oulton Park rounds as the combined might of the UK’s meteorologists could not make up their mind during the run up to this seventh round of the NG Road Racing championship series. Friday’s circuit test day was interrupted by thunderstorms, which everyone hoped would clear the air, and everyone woke to a dry day on Saturday. The qualifying heats went off as planned and the skies stayed clear, but as the first of the finals came to the line the skies darkened and things took a turn. Barnsley boy Chris Barnes on his AP Broome ZX10 set a blistering time in qualifying some 1.5 seconds faster than Phoenix Open series leader Josh Day, local man Jamie Harrison and Mark Cheetham on his 899 Panigale, and all this with a nice dry track. However…..come the final the track was wet and Barnes, Cheetham and a whole host more failed to arrive to the grid. Day on his Dayo Racing Crank R6 though grabbed his chance and he and Chris Taylor on the In Corse ZX6R set the pace. Taylor with looking comfortable in the conditions and started to ease a lead. That was until the front end washed out at Lodge with just two laps to go. Day kept his head and took the win from a charging Matthew Waldron and an impressive Peter Carr who after 18 months of searching to a wet set up on his 675 looks to have found it as he stormed through to third. 15 year old Josh Singh took another 25 point scoring win to make it five wins from seven starts on the little 125 Aprilia in the Formula 125 class. Tim Bradley had made the overnight run from the Isle of Man where he had been holidaying at the TT to again get the better of the Formula 400 grid. It looked like John Price might have the measure of him here after beating Tim in the qualifier. But as ever it looked like Tim had something in hand for the final. Tom Harrison had been going well in third on his overnight-rebuilt CBR Honda but the conditions got the better of him and the baby blade. John Price was also out in the 500 open and made no mistake there taking an emphatic win over Tony Bridgefoot. Dave Hampton lipped down to fourth in the standings after the Tigcraft Mini Moto Single developed an oil leak that saw Hampton black flagged. 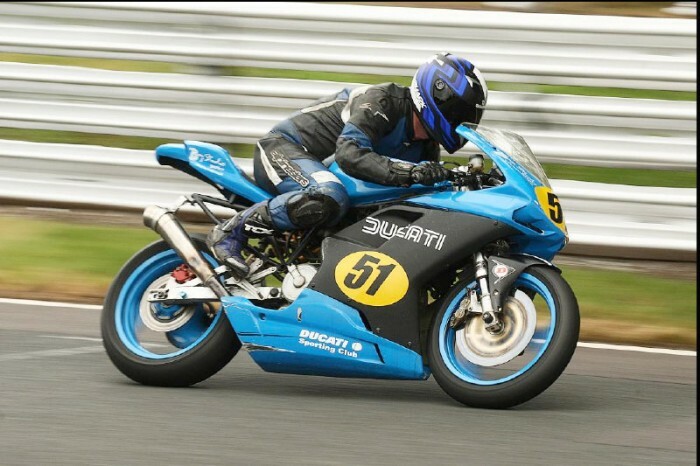 Another rider going one better was Tony Bridgefoot who bettered his second place in the 500 into a win in the GP45 class. The Formula Prostock series is running with NG this year and they have three classes. The FP1 for Pre 1987 Supersport and Superbikes which was taken by Andrew Howe on his newly acquired GSXR750 Suzuki. Then there are the FP2’s which are for twin shock air cooled bikes which had Chris Saltinstall take his fourth win on the bounce on his 950 Moto Guzzi Le Mans. FP3’s are the biggest class and they are the Suzuki Bandits. Chris Newbigging, the Performance Bikes journo finished best part of a minute clear in this one in his first outing of the year. Series co-ordinator Keith Chambers heads the championship though, and he grabbed more good point with second here in the wet. Andy Blomfield took his tally of win in the Desmo Due series to six as he took a pair in wins in the one make series. Paul Payne came oh so close though to his first win after Blomfield got tangled with backmarkers on the last lap to close to within 0.1sec at the flag. Peter Pritchard continues to dominate the 600ccc B class posting another unbeaten weekend on the Bay Studio Signs Duke. Jon Wright took his CBR600 to another pre injection win over Liam Turberfield, setting a new class lap record in the process. The bigger 130 pre injections also was a new class lap record as Jason Edwards took his R1 to victor over two time champ and current series leader Adam Jeffery. Tom Williams the current 700 Streetstock champ closed the gap to this years top man Eddie Whitehurst with his fourth win of the year, whilst after having 12 month off track Ciaran Blight bounced back with a win in the 1300 Streetstock final over Paul Jeffery and Richard Hughes. Jeffery was lucky to stay on his R1 in the wet after a high-side saw his big Yam brake his steering damper clean in two !!!. The 600cc Open was another rain-affected race with it being stopped to allow a chain of tyre. In the restart Chris Mort on his Wyatts/Crewe Honda Centre CBR was quickly into his grove. Series leader Josh Day chased, but Mort’s pace was too hot and Day tumbled from his R6 in his pursuit of the local man. Mort went on to take the win over Kiaran Hankin and Joe Ravenscroft with Chris Taylor and Max Symonds literally in his wake. In a battle of 899 Panigale’s Jonathan Railton took his Boast Plumbing 899 to the Sound of Thunder win over the hard charging Louis Dawson, Sam Middlemas, Mark Cheetham and Nicky Wilson…..all using the trick 899’s. Jonny Towers set a new lap record on his way to the win in the Super Twins final, in one of the few dry track spells, The Team edge ER6 getting the better of series leader Tom Blackwell on his SV. The final race of the day was the Mini Twins and it saw a great battle between Alan Russell, Tom Blackwell, Rob Garland and Paul Williams. Williams, one by one picked off his rival to take his first ever main class win on his Ace Motorcycles of Bude SV650, earning his the Performance of the Meeting award. Red Flags and Climatic Challenges for 125 and 250GP ACU National Championship. In the dry morning conditions reigning 250GP champion set pole some 1.5 second quicker that Dan Jackson and Josh Owens who was on his Moto 3 bike. Whilst in the 125 it was once more Arnie Shelton setting the pace with a good gap over Stephanie Waddelow and Jamie Edwards. The final though only lasted 4 laps of the scheduled 10 as a downfield rider fell at Lodge, leaving a 40-metre trail of fluid. First on scene were the leading quartet of Atkinson, Jackson, Owens and Ant Hodson. All four were taken down by the spillage and the red flags came out. This also coincided with another downpour. The organisers have held this round over until the Anglesey meeting as time curfews meant that the timetable was squeezed. The Hannafin Team turned up to Oulton with testing on their agenda. Ben Holland and Lee Watson lapped quickly and consistently in qualifying taking the race by almost 30 seconds. The final went off and Ben and Lee settled into the groove once more showing just why they are one of the UK’s top crews, but the race was stopped after lap 2 as Roger Stockton and Sharon Doodson flipped the D & D Windle at Knickerbrook. Roger was trapped in the outfit but despite Sharon being thrown clear suffered two broken wrists.